The World War One Battlefields site is undergoing a major update, with pages being converted to a new, user-friendly mobile format. 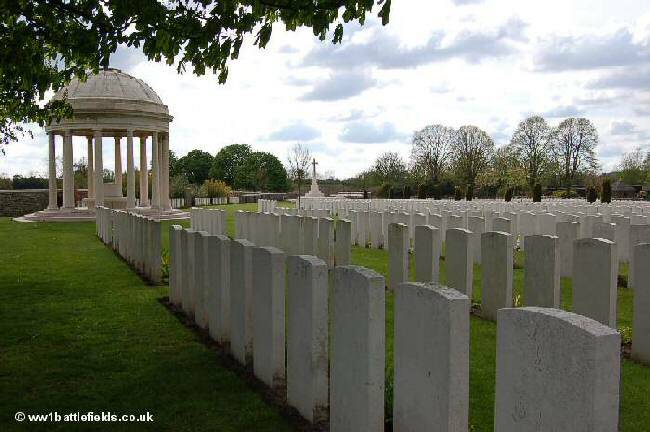 The updated pages can be found at Updated World War One Battlefields. Some pages such as this one remain in the original format pending update. 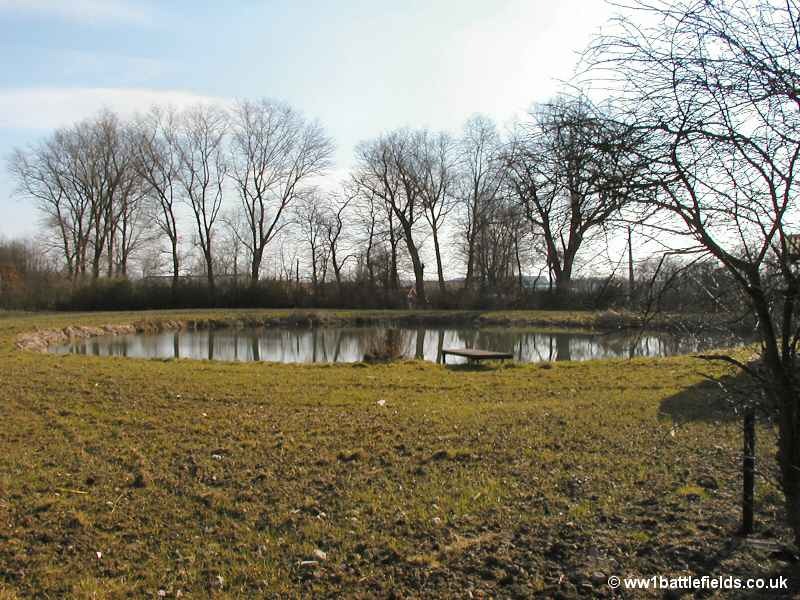 This page covers several sites south of Ypres which do not fall readily into any of the other pages in the Flanders section and which are of interest to the battlefield visitor. 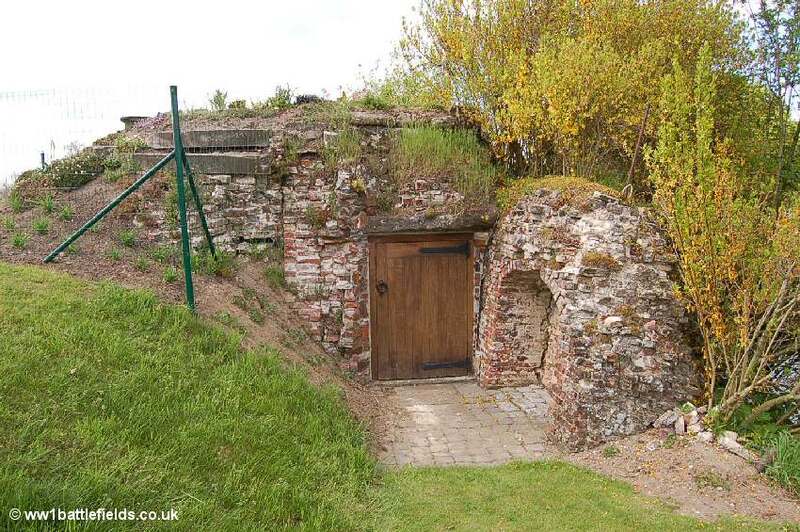 They include the large and interesting Bedford House Cemetery, the villages of St. Eloi and Oosttaverne plus other sites (including a number of bunkers). Leaving Ypres through the Lille Gate and travelling south on the N365, after around a mile a large cemetery is reached on the left hand side. This is Bedford House Cemetery. This is a deceptively large cemetery, with an interesting history behind it's development and why it looks as it does today. At first, from the road it can appear looks quite small. The entrance way is impressive however, with gates and a driveway lined with conifers - it looks somewhat like the entrance to a large house. This is in fact what Bedford House was - the name was one given by the British to an exisiting Chateau that stood here. This was the Chateau Rosendal, and as well as Bedford House it was sometimes known by the British as Woodcote House. The cemetery consists of a number of 'Enclosures', and the one immediately visible from the road to the left of the entrance way is Enclosure 6. This is across the moat which runs to the left of the drive, but can be reached by turning immediately left on entering. The other Enclosures are reached by continuing straight on along the drive. 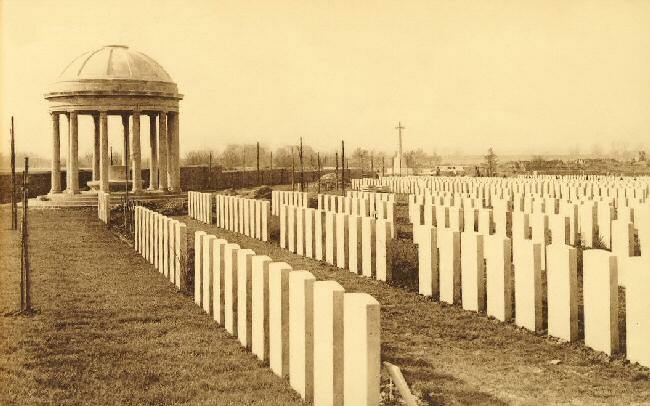 In all there are 5,139 Great War soldiers buried or commemorated here, with over 3,000 of these being unidentified. Enclosure No. 6, according to the current register, is the only one which was made after the Armistice (although other graves were brought into other existing Enclosures post-Armistice). Today CWGC records state it was made in the 1930s as remains of soldiers continued to be found in the surrounding battlefields. 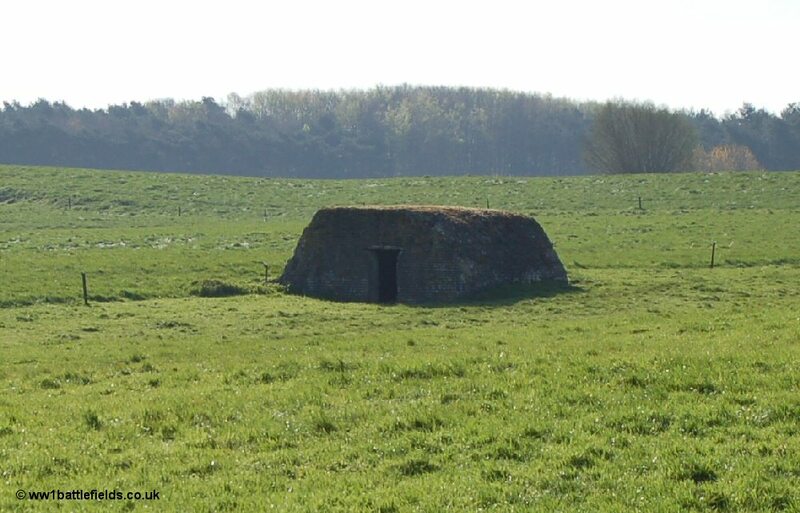 However, in earlier versions of the register this Enclosure is described as one which was lost and then rediscovered later (thanks to Paul Reed for this information). 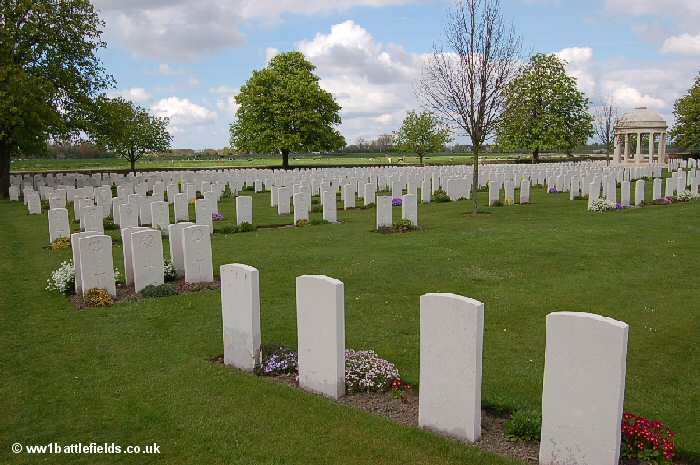 There are also burials from the Second World War here, in semi-circles of headstones towards the rear of the Enclosure. 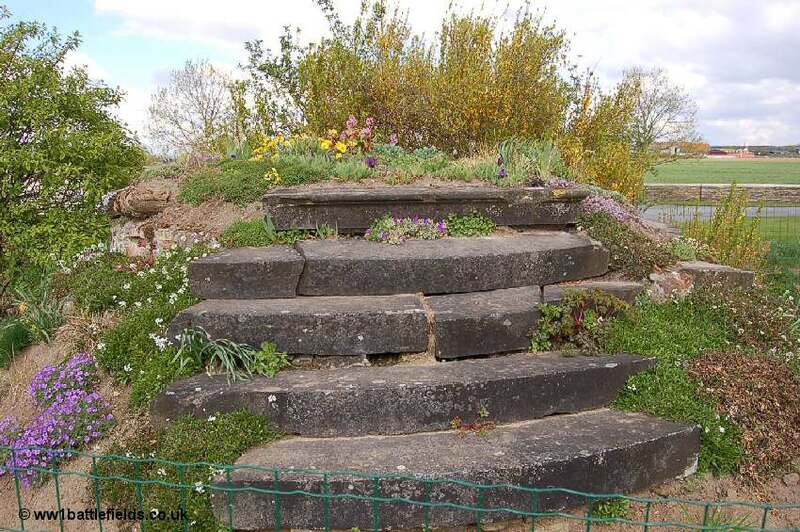 The chateau which once stood here was largely destroyed during the War, but there are a few remnants which can be seen at the far end of Enclosure 6 - including a set of steps. The driveway leads on to the rest of the cemetery. Enclosure No. 2 is the next reached; this was started in December 1915, and used until October 1918. Nearly 450 more graves were brought here after the Armistice, mainly from Ecole de Bienfaisance and Asylum Cemeteries at Ypres. 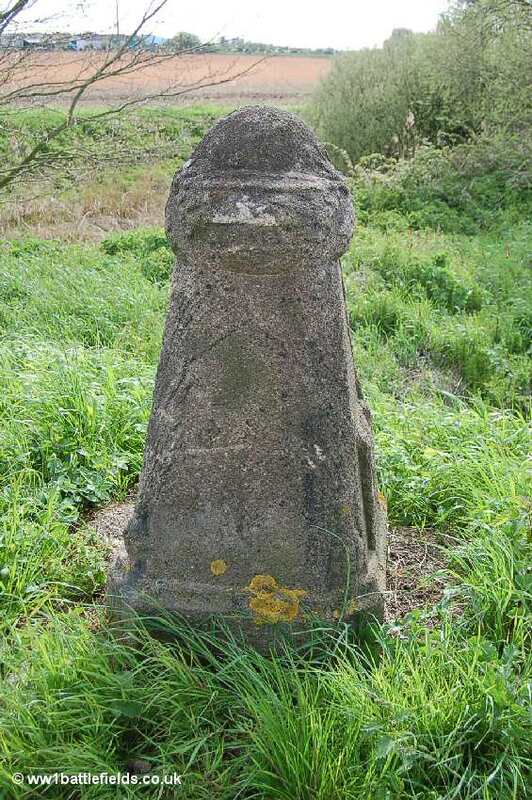 There are also special memorials to men originally buried in those cemeteries whose graves were later lost. Continuing past Enclosure 2, the cemetery register is located by the Cross of Sacrifice, which is roughly half way back in the cemetery. The register is quite detailed, giving information about the various Enclosures, the cemeteries which were brought here, and also the Second World War graves. Enclosure 3 is to the left from here, over the moat, and is the smallest one. There are only a few graves here, although it was in use for nearly two years from February 1915 to December 1916. There are special memorials here for men who were buried in four other cemeteries - and also to those buried in Enclosure No. 1 here at Bedford House. Enclosure No. 1 no longer exists; the graves were removed to White House Cemetery at St. Jean (see East of Ypres page). Located behind the Cross of Sacrifice is Enclosure No. 4, now the largest of the Enclosures. 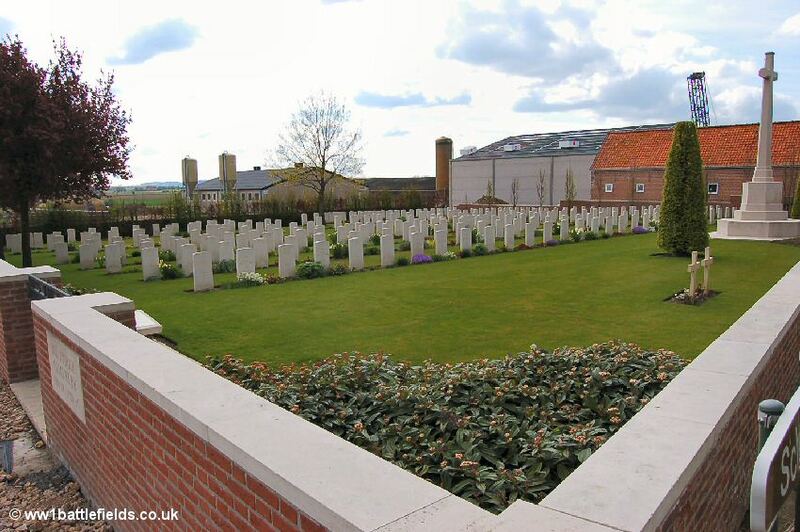 It was made mainly by the 47th (London) Division between June 1916 and February 1918, but more than 3,000 graves were brought into this Enclosure after the Armistice. The graves here are mainly regular in layout, with the Stone of Remembrance located towards the rear, as well as two rotunda structures. I have several old pictures of the cemetery, inclduing two before before it was made permanent. 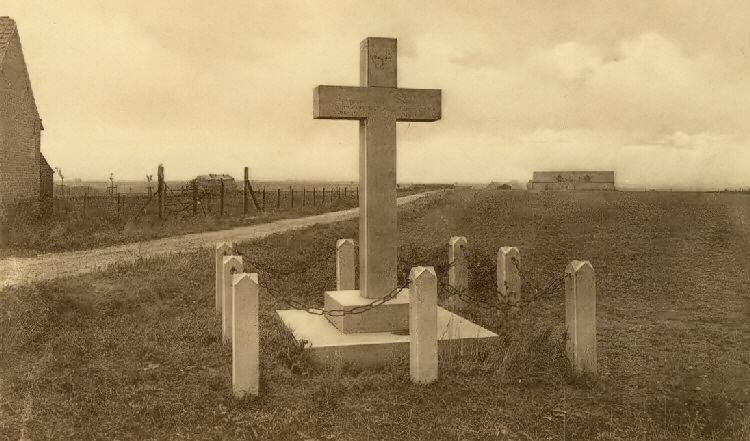 One of these is shown below, and one of the names on the crosses can be read - F.J. Provis on the white cross two to the right of the cemetery sign - which allows the location to be determined as Enclosure 4, Plot 1 Row E. Plot 1 comprises original war-time burials in this Enclosure, and today's view can be compared with the original. 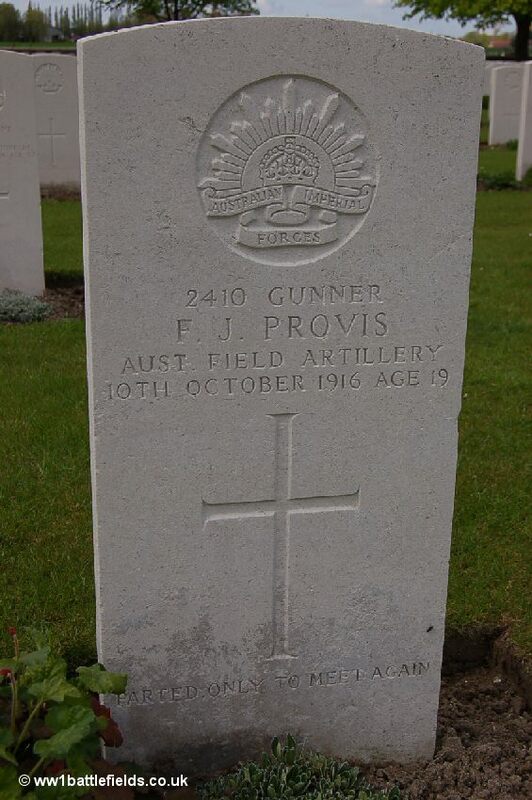 The grave of Gunner Provis is one of two together, and there is another cross set in front of it. However today, there is just an area of lawn in front of the two graves (which are almost exactly in the centre of the modern picture) - no grave exists here now, and one wonders what the story is behind this. Francis Joshua Provis enlisted at Melbourne in the Austalian Army on the 5th of May, 1915, at which time he was a Clerk. He had applied to join up a few days earlier, but because of his age (18 years and 8 months) he needed to obtain a letter from his mother, Helena, giving her consent for him to enlist for service abroad. Provis arrived in France at the end of March 1916, and in August was transferred from the infantry to the Artillery - 6th Battery in the 2nd Australian Brigade. Only two months later, at the age of 19 he was killed, dying from shrapnel wounds in his back. He is reported as being buried at 'Bedford House New Cemetery'. Another old postcard I have shows the cemetery with headstones, so probably sometime in the late 1920s or 1930s. The views are similar, but it can be seen that the row of Special Memorial 'headstones' against the wall beyond the rotunda are not present in the earlier photograph. It should be noted that as well as Enclosure 1, the graves from Enclosure 5 were also relocated - to Aeroplane Cemetery near Potijze. The full story behind this cemetery must be interesting, and perhaps one day documents will be available to fully explain it. 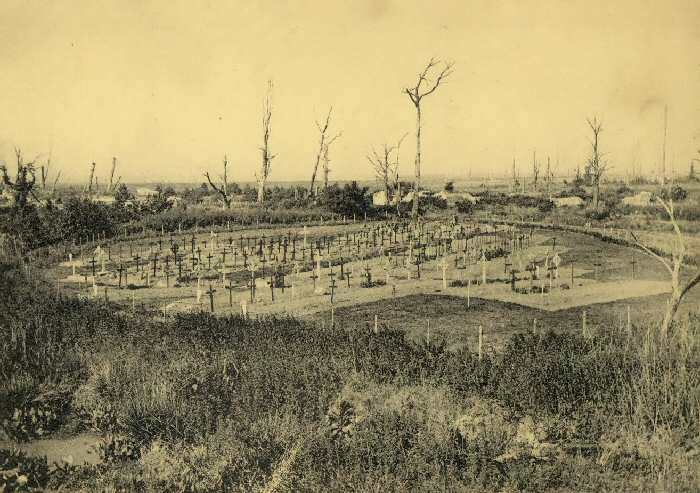 The second postcard I have of the cemetery in very early days I believe was taken from Enclosure 6 by the ruins of the chateau, and shows plots 1,2 and 3 of Enclosure 2, before the others were added. This is based on the moat being visible in the earlier picture, and also the layout of the graveswould have been very similar without the rows in the background in todays view - these are Plot 6 which was added later. Leaving Bedford House Cemetery and continuing south, one of the demarcation stones can be seen by the roadside. Continuing south, on the left of the road is a cluster of bunkers. They cannot be reached, as they are on private land, but are clearly visible. 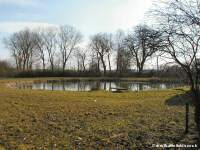 These are within a farm, and this spot was known as Lankhof Farm during the war. This was the site of various battalion and Brigade headquarters during the War. From here, travelling south into St. Eloi there is a road leading off north-west just as the village is reached. A short distance along this road is Bus House Cemetery. A new warehouse was being built right behind it when I last visited in mid-2006. The cemetery wall at the back right had been damaged as well. Bus House was the name given to a farmhouse here during the Great War, as there was a broken down London omnibus here. The spot is mentioned by Clapham in his memoirs Mud and Khaki. In early April 1915 he describes how 'suddenly out of the darkness in front of us there loomed up the spectre of a London bus, broken and derelict, but still standing at the side of the road'. Several London omnibuses were used as troop transports on the Western Front. Clapham's battalion used the trench which started by the bus, known not surprisingly as 'Bus House trench', which he described as a 'well-made trench'. 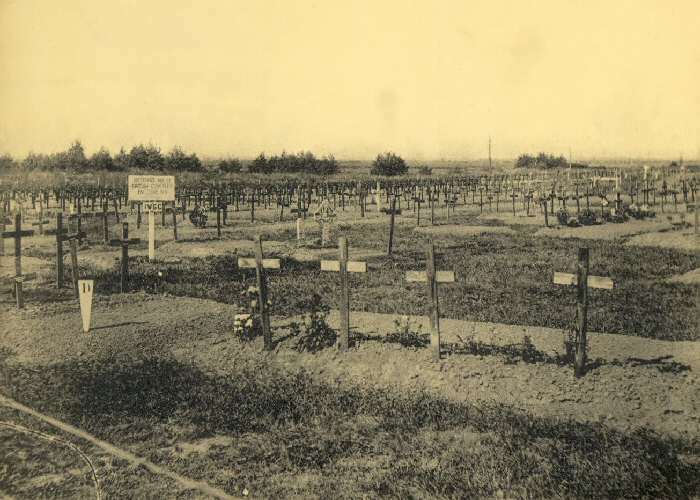 The cemetery was used mainly for a few months in 1917, although a grave from 1915 was brought into the cemetery during the War and four burials were made in 1918. 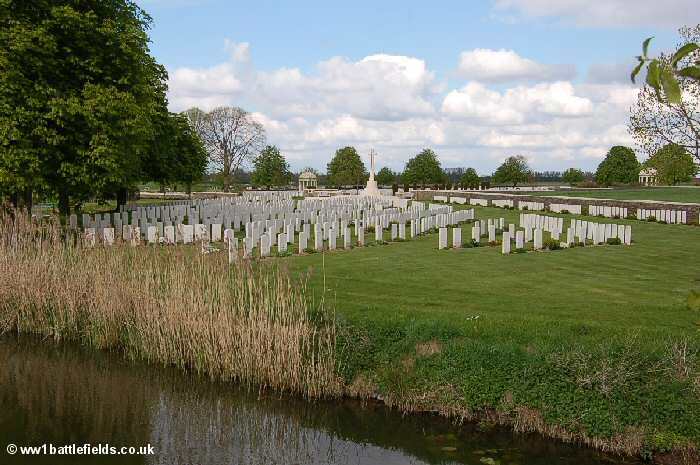 In 1941, graves of men killed during the Second World War battle on the Ypres-Comines canal in 1940 were brought into the cemetery. The Second World War graves are scattered throughout the cemetery, but mainly to the front and the right. 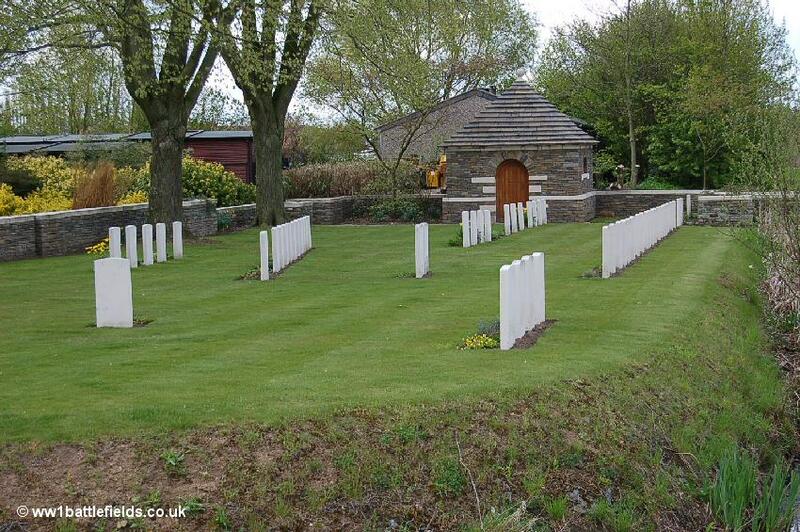 There are now 79 Second World War graves, and 206 First World War graves, twelve of which are not identified. There are also two French graves located at the front of the cemetery. 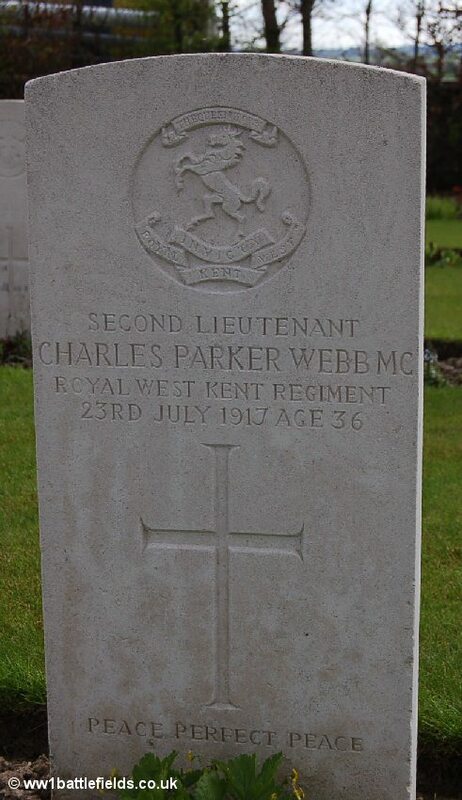 One grave which caught my eye here was that of Second Lieutenant Charles Parker Webb, which has the inscription 'Peace Perfect Peace'. Charles Webb was 36 when he died on the 23rd of July 1917, serving with the 3rd Battalion of the Queen's Own (Royal West Kent Regiment), to which he was attached from the 11th battalion. He was a Military Cross holder, and his citation (published in the London Gazette on the 24th of August 1917 reads 'He set a fine example by his disregard of danger during an advance on two occasions, repulsing and bombing hostile bombing parties'. The citation does not give the date or place the MC was awarded for, but it is likely to have been for actions before the time he was killed. The graves of three other Royal West Kent men who died the day after can be found together nearby. Continuing south on the N365, the next village reached in St. Eloi (today St-Elooi). 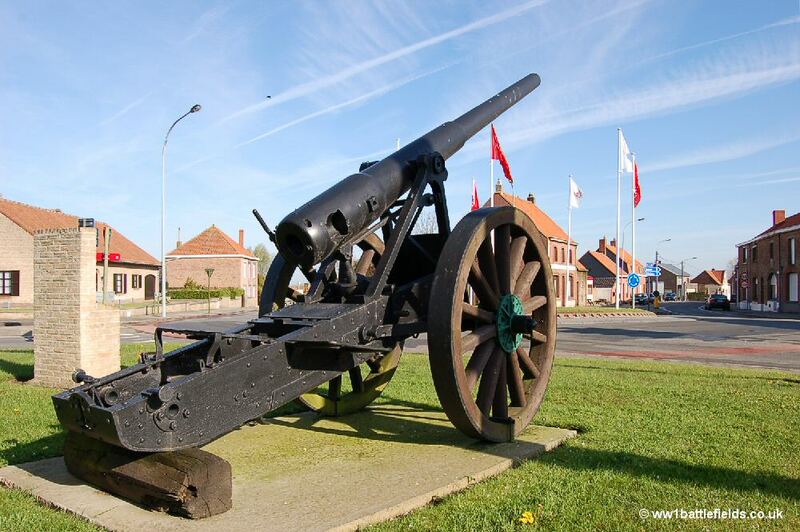 Located at the roundabout is a field-gun. This is a Belgian Krupp 95 mm gun (thanks to Tom Morgan via the Great War Forum for this identification), and seems to have been placed there in perhaps 2003, but there seems to be little other information on it available. Near the field-gun is a brick-built stand with aerial watime pictures of the craters here. There was mining well before the Battle of Messines in June 1917 (famous for the use of mines). In 1915, the British exploded 13 mines and 29 camouflets (counter-mining charges), and the Germans 20 mines and two camouflets. 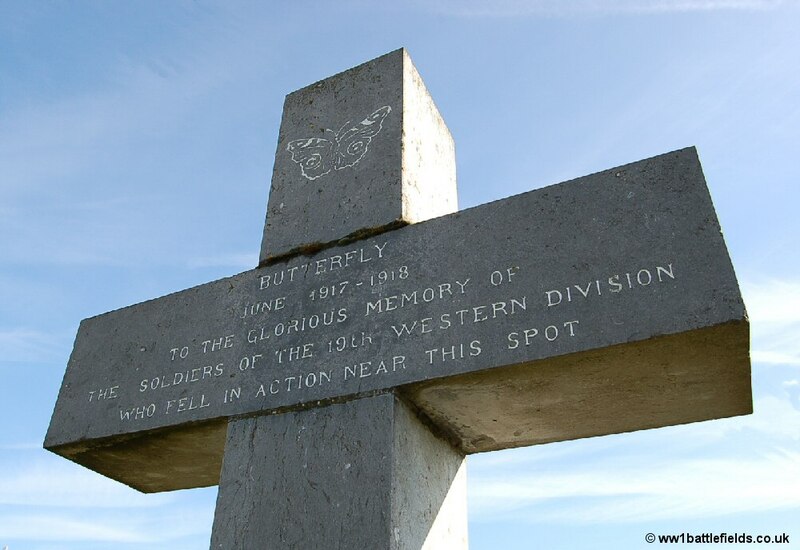 However, this memorial commemorates the actions of the St. Eloi craters between the 27th of March and the 16th of April 1916. One of these 1916 craters can be seen today, although it is on private land (behind the house on the other side of the road from the memorial). Six mines were exploded at 4.15 a.m. on the 27th of March - with shells from heavy howitzers being fired 20 seconds before zero hour and from heavy guns 10 seconds before, so they would land at the smae time the mines were fired. The infantry of the Third Division scrambled to occupy the craters; the 1st Northumberland Fusiliers made good progress, but on their left the 4th Royal Fusiliers were held up by machine-gun fire. The Germans occupied two of the craters, and tried a few days later to take another from the British. 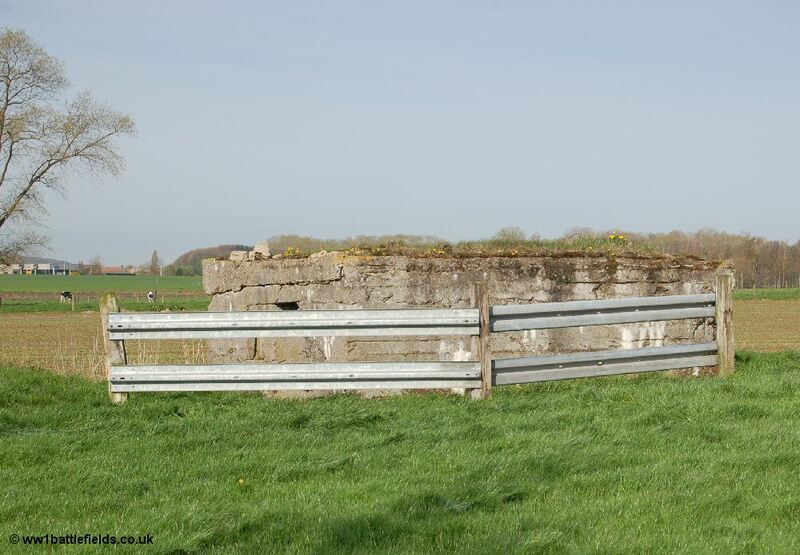 On the 3rd of April, the 8th Kings Own forced the Germans out of one of the craters, and the 2nd Canadian Division took over the positions here that night. On the 6th of April at 3.30 a.m. the Germans attacked, taking four of the craters. The front line positions and the situation must have been incredibly complex and difficult to understand, made harder by the fact that the six new craters now made a total of 17 in the area, and telling them apart especially in the dark must have been nearly impossible. The Canadians made several attacks over the next few days to try and recover some of the craters, but these failed, and in view of the forthcoming major operations on the Somme no further offensive moves were made here. 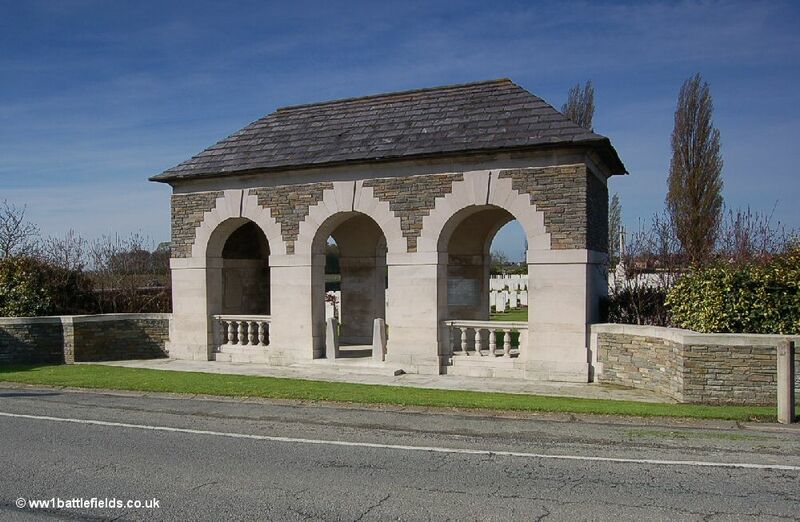 On the lower part of the memorial is a poem by Thomas Hulme, titled 'Trenches of St-Eloi'. 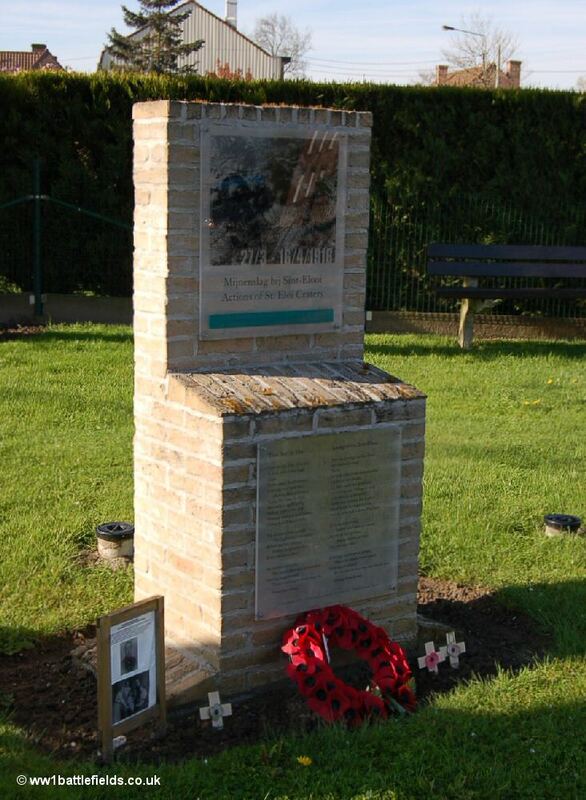 The memorial was unveiled on the 11th of November 2001. Next to it when I last visited was a small wooden stand, in memory of Private Joseph Toms of the 12th East Surreys, with pictures of him both in uniform and with his family. Toms died near here in April 1917, although the CWGC gives his date of death as the 3rd of May. He was from Epsom, and was just 20 when he died. He has no known grave, and is commemorated on the Menin Gate. 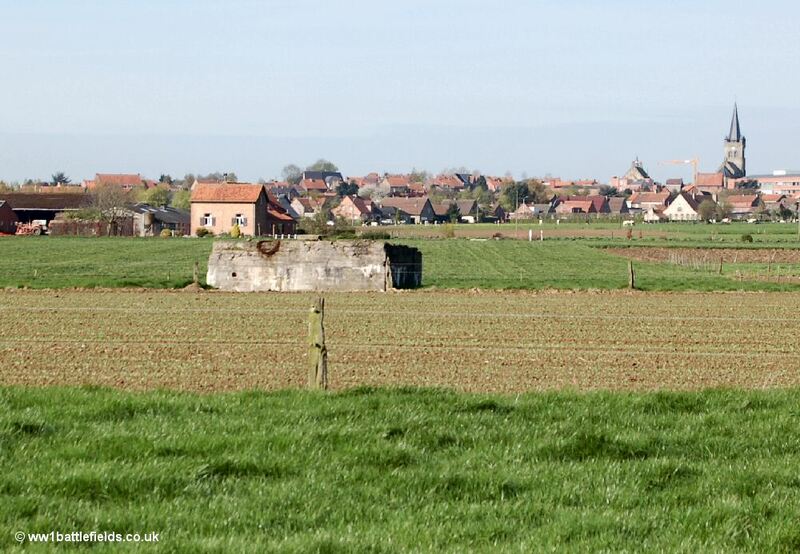 Following the road past the field-gun (and the crater), leading from St Eloi towards Oosttaverne, on the left side of the road in the middle of a field and just before a farm is a large bunker. Oosttaverne is on a slight hill, and you can see Wytschaete church on the next ridge along from it. The 19th (Western) Division Memorial is at a cross-roads where the road towards Hollbeke leads off. 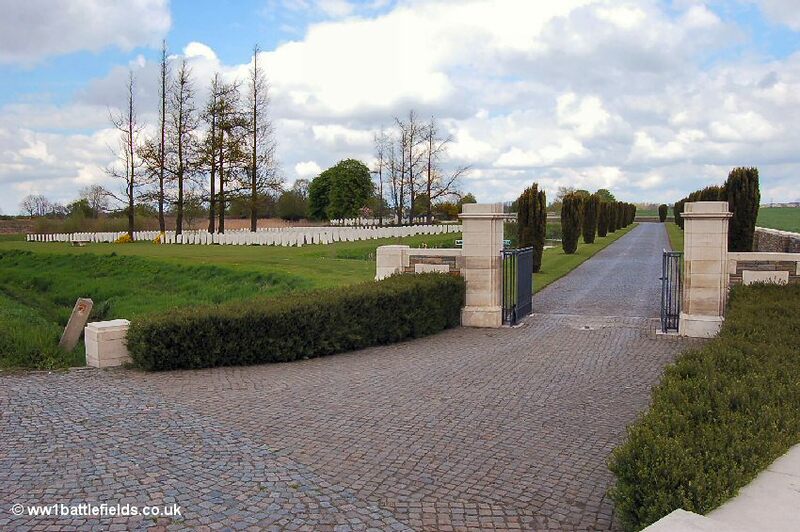 On the other side of the cross-roads is a war cemetery (see below). I have an old postcard of the memorial, probably from sometime in between the wars, and although the views are remarkably similar, there are a few differences. There are no small columns now around the memorial, and the track in the old picture is now a metalled road. However, several of the buildings can be readily identified in today's scene. 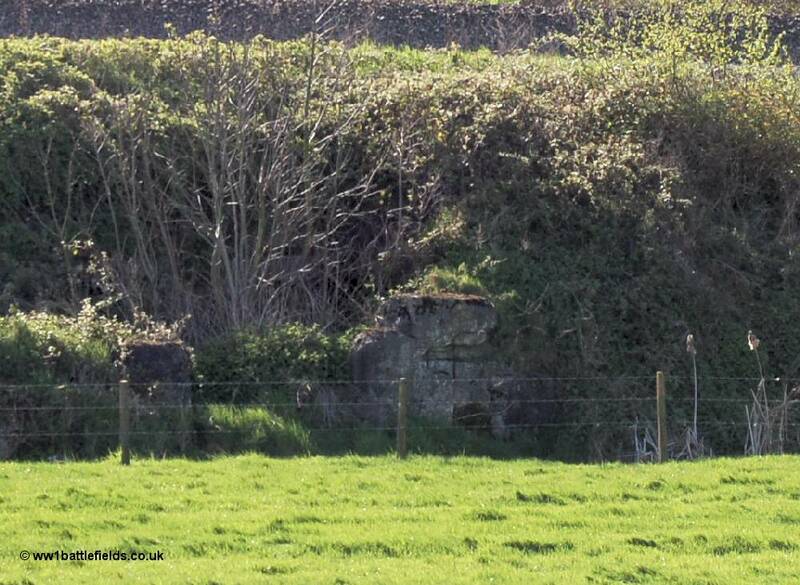 There looks to be a bunker visible behind the farm buildings in the old picture, but there is no trace of this today. The 19th Division Memorial is identical in design to that seen at la Boiselle on the Somme, and like that one lists the units which comprised the Division on the base. It also shows the butterfly emblem of the Division at the top of the cross. The 19th Division were involved here on the first day of the Battle of Messines (June the 7th 1917), when they took the village. 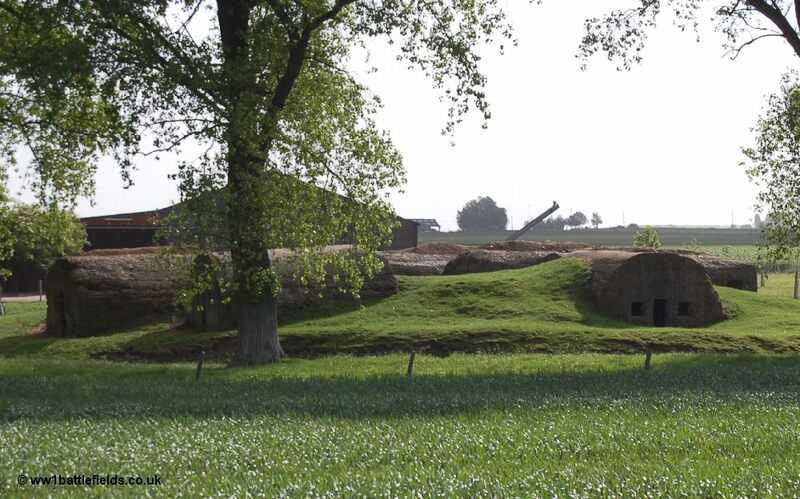 The 19th Division, aided by the three mines exploded at Hollandscheschuur Farm, made excellent progress on their frontage with significant gains made. In the afternoon it was the 57th Brigade which advanced to reach the German positions known as the Oosttaverne Line, along with Brigades from other Divisions on either side. Oosttaverne Wood Cemetery has a triple-arched entrance structure. Today it is one cemetery, but originally there were two cemeteries (known as No. 1 and No. 2) located here. Plots 1,2 and 3 at the back of the cemetery are the original graves. They were made by the IX Corps Burial Officer after the village was captured during the Battle of Messines (June 1917). The burials continued here until September that year, and after the Armistice, more graves were brought in including many from Hill 60 and also from German cemeteries in the area. This concentration must have been after 1925, as in The Immortal Salient published that year Pulteney and Brice describe it as 'Oosttaverne Wood Cemeteries No. 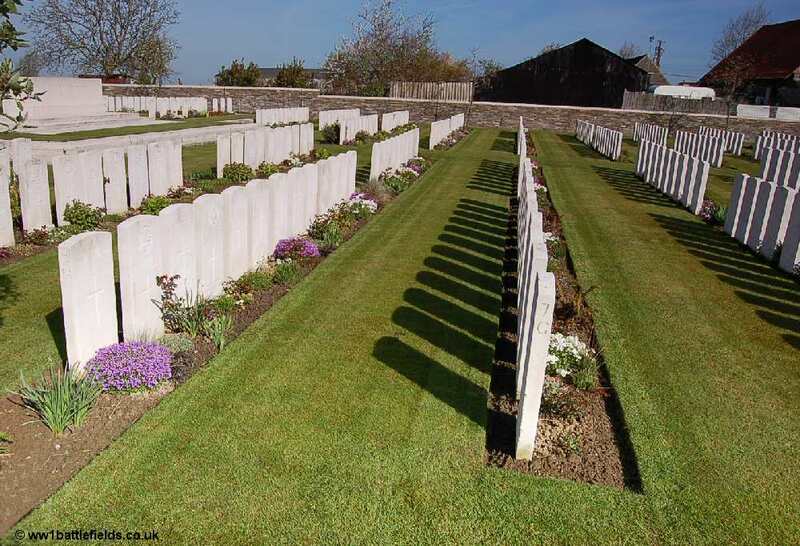 1 and 2 together - two small cemeteries used in June and July 1917'. The grave layout in the original plots is less regular than the concentration plots in the rest of the cemetery. Some rows of graves in front part of the cemetery have flowerbeds on either side. 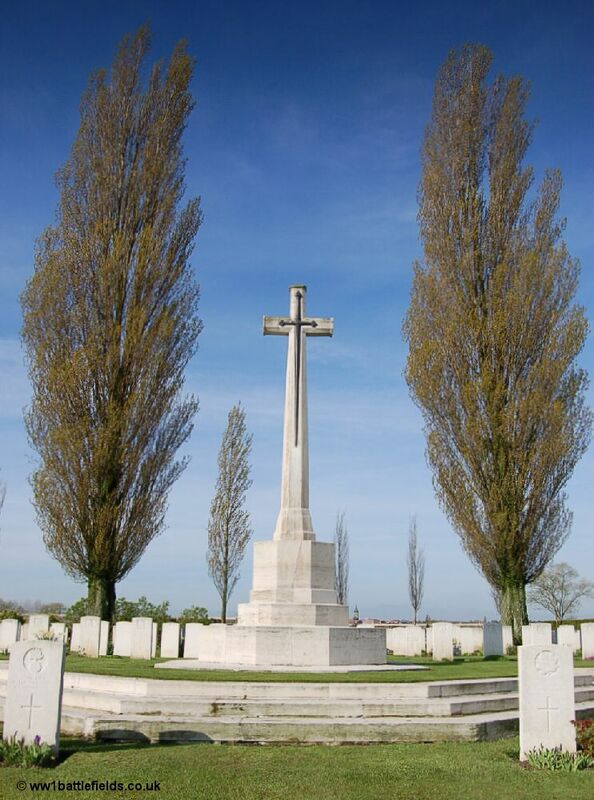 Altogether there are now 1,119 Great War soldiers buried here, over half of whomare unidentified. There are also 117 Second World War burials here. From the rear of the cemetery there are good views towards Wytschaete and also two bunkers can be seen in the fields behind. One is fairly close, with metal railings in front of it, whilst the other is further away. 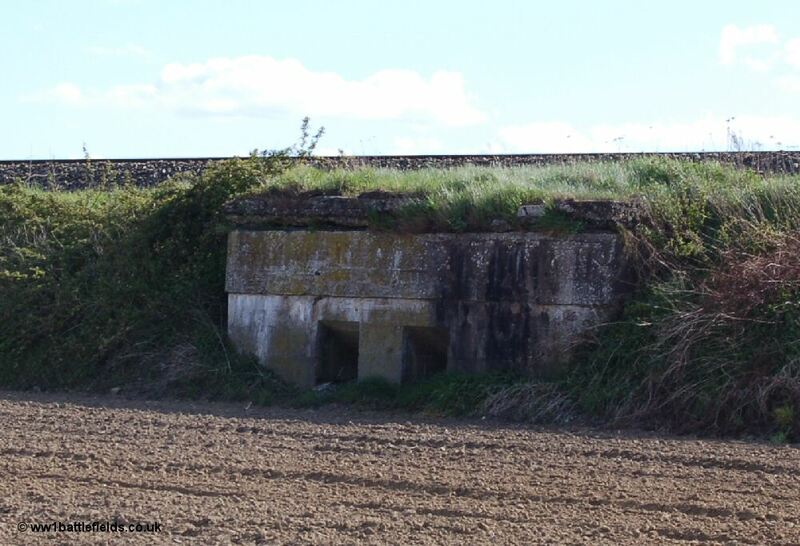 Further east, towards Hollebeke, there are more bunkers to be seen. These are set against the railway line as it runs along an embankment (the canal also runs here), and these positions would have offered good protection from artillery fire. 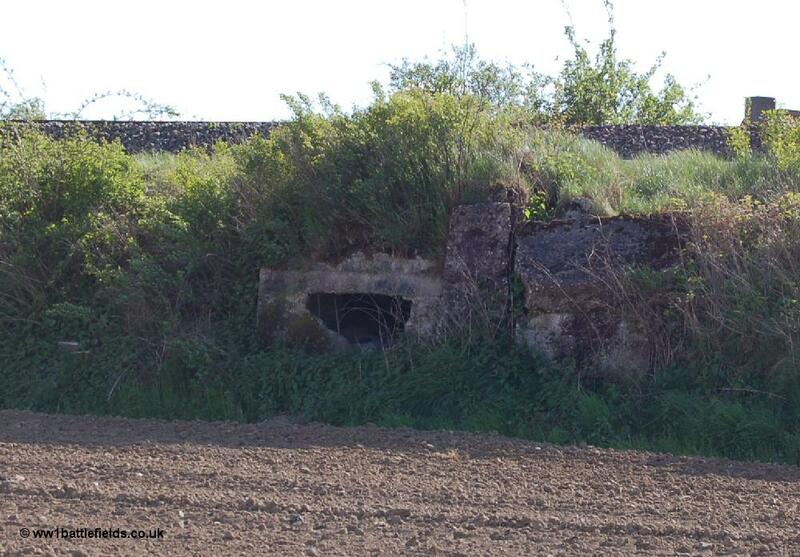 The bunkers are in various states of repair from good to only vestiges remaining (see pictures below).